But American media has had a tough time acknowledging the dispiriting truth that Egypt’s presidential race is now a contest between theocratic Islamists such as the Muslim Brotherhood’s Mohamed Morsi and Abouel Fotouh on the one hand, and autocratic former Mubarak regime officials such as Amr Moussa and Ahmed Shafiq on the other. Instead, the country’s major newspapers have gone out of their way to designate a hero. The Wall Street Journal thus whitewashed Abouel Fotouh as “relatively liberal,” while The New York Times dubbed him a “liberal” outright. Any judicious reading of Abouel Fotouh’s record would contradict these characterizations. Abouel Fotouh’s reputation as a “liberal Islamist” is largely the product of his views on political inclusion. As he notes in his memoirs, he has long advocated for the right of women to run for political office, and he similarly supports Christians’ right to run for president. These stances put him at odds with his more fundamentalist colleagues in the Muslim Brotherhood, including Brotherhood presidential candidate Morsi, and it was one of the reasons for his ouster from the organization’s Guidance Office in 2009. But it was not the primary reason. As Abouel Fotouh told me during a March 2011 interview, his disagreements with the other Guidance Office members were mostly about the organization’s dictatorial internal structure, which he wanted to reform by instituting term limits. “I left because I pushed for an amendment that people can only stay in the Guidance Office for eight years, and I asked thirteen other members to [leave the Guidance Office] as well,” he said. “But they refused.” Yet despite his falling out with the Brotherhood’s brass over this administrative matter, Abouel Fotouh remained quite committed to the organization: he was a member of the Brotherhood’s Shura Committee—its 100-member policy-making body—for another year-and-a-half, and was among the Brotherhood’s most visible advocates to the international community during the January 2011 revolt that toppled Mubarak. His ultimate departure from the Brotherhood in the summer of 2011 was similarly not because of ideological disagreements, but strategic ones: the Brotherhood leadership vowed not to nominate a presidential candidate, but the ambitious Abouel Fotouh declared his candidacy anyway. Like the Muslim Brotherhood, Abouel Fotouh embraces an interpretive “maqasid” approach to sharia, which places a rhetorical emphasis on broader aims such as justice and compassion. 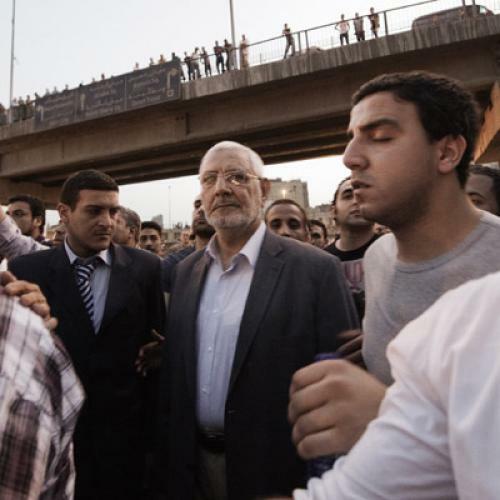 But also like his colleagues in the Muslim Brotherhood, Abouel Fotouh’s progressive façade frequently slips. In this vein, when military vehicles ran over a Christian-led demonstration outside of Egypt’s state-run media building on October 9, killing 28 people, Abouel Fotouh blamed the Christians for choosing “the wrong place and the wrong time” to demand their rights. He further stated that the massacre advanced the “foreign and Zionist aims of igniting sectarian strife in Egypt.” Abouel Fotouh’s insensitive response to the killing of Christians was hardly out of character. When the U.S. released a report in 2007 criticizing the Mubarak regime’s treatment of Copts, Abouel Fotouh called it “divorced from reality,” and belittled anti-Coptic discrimination by claiming that anti-Muslim discrimination in the West was worse. On foreign policy, Abouel Fotouh similarly echoes the views of Brotherhood hardliners. For starters, he’s a 9/11 conspiracy theorist. “I don’t believe it was jihadists,” he told me, when I asked him whether he thought that al-Qaeda was responsible for 9/11. “It was too big an operation. … They didn’t bring this crime before the U.S. justice system until now. Why? Because it’s part of a conspiracy.” He has also refuses to recognize Israel, supports ending gas sales to Israel, and has indicated that he would either end or amend the Camp David Accords, which he says were “imposed” on Egyptians. Of course, it is impossible to know whether Abouel Fotouh will be elected; that decision ultimately rests with the Egyptian people. But it is the responsibility of the media in the United States to prepare the American public for what may be in store. If Abouel Fotouh is elected, he is liable to create a host of challenges for the United States, as well as for many Egyptians. Downplaying those challenges by pretending a longtime Islamist is actually a progressive liberal will do absolutely nothing to solve them.